This page contains some goodies you might find useful. Ask your parents if you need help to download and print these pages. There are more goodies on the pages For Teachers, For Parents and For Kids. Enjoy! Download a copy of the hand outline and print a copy. Think about 5 people you trust and write their names onto the hand, one for each finger. You can colour and decorate the hand if you wish. Keep your list in a safe spot. If you have a problem call on one of the people on your list to work through Ask Ed with you. They might help you with ideas or help you put your ideas into action. If you are not able to print a copy of the hand, trace around your own hand, cut it out and write your list. People you trust are important in your life. Share your problems with them and ask for help if you need it. Download People I Can Trust poster. Print a copy of the Catastrophe Scale for yourself or the whole family to use. Put it on the fridge, in your room or on a notice board. It will always be available to rate problems. 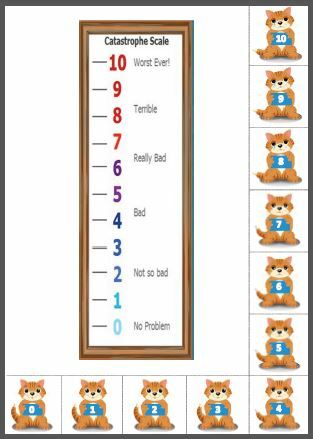 Cut out the pictures of Ed and attach them to your Catastrophe Scale when you have a problem. Print a copy of the Ask Ed Flyer and post it on your local community noticeboard. Help spread the word and build a community of kids that grow into resilient adults.